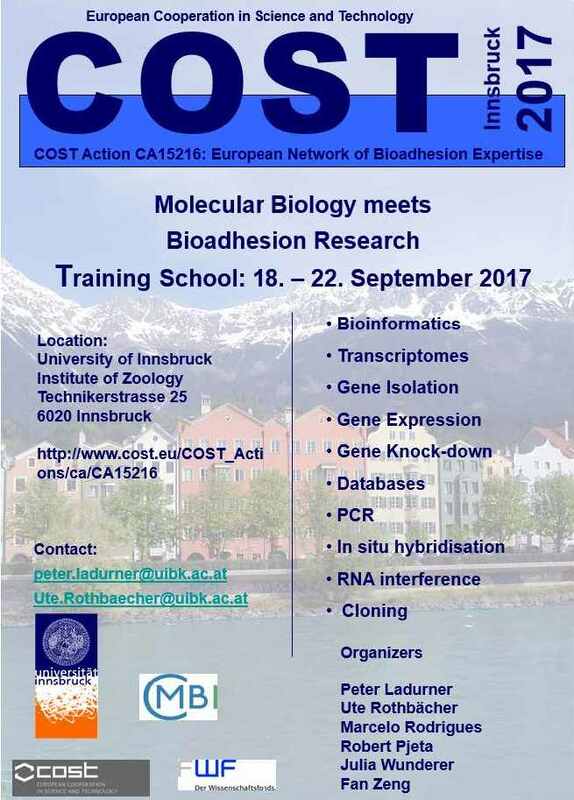 The Austrian MC Peter Ladurner and the MC-S Ute Rothbächer will offer this Working group 1 training school to interested ENBA members, which aim to receive fundamental aspects of molecular biology tools to Bioadhesion Research. Theoretical background will be provided on molecular biology methods (including next-generation-sequencing, NGS), transcriptomes, genomes, databases, BLAST searches, alignments, primer design and high resolution imaging. In the TS the MC members will isolate, clone and sequence adhesion related genes (PCR, Polymerase Chain Reaction; Cloning), study the expression of genes (In situ Hybridization) and switch genes off to analyse their function (RNA interference & CRISPR). Strategies will be presented for adhesive gene identification in non model organisms using a molecular biology approach and participant case studies can be discussed. Further details about the TS and planned programme could be found here. maximum 10, whereas people with none/little background or hands-on experience in Molecular Biology methods will be favoured. Also Early Career Investigators (ECI, defining careers with less than 8 years from PhD at the time of involvement in the COST Action) have priority for the Training School. COST Action CA15216 will assure gender balance and promote “women in science and technology”. An amount of EUR 650,-/applicant is awarded on competitive basis. This includes a training school registration fee of EUR 350,- that will cover accommodation in Innsbruck, local transport and expenses for the Field trip/Workshop. The travel to Innsbruck (Austria) and back home is funded with maximum EUR 300. For further details, please ask the TS organiser Peter Ladurner and Ute Rothbächer or contact the Action Chair. If you obtained your Phd/doctorate (or similar experience) degree at and after 2008, your are an ECI. If you currently work on your PhD thesis or obtained the degree before 2008, you are NOT an ECI.